Cognitive Behavioral Theory, or CBT, is a theory of counseling that believes that our thoughts cause our feelings, and our feelings result in our actions. The idea is that if we can identify our thoughts, we can change our feelings and thus our actions. Which person do you think will end up performing better in the class? “…perhaps you hate a thing and it is good for you; and perhaps you love a thing and it is bad for you. And Allah Knows, while you know not” (Surah Baqarah, 2:216). The challenge is that many of us are not aware of our thoughts! We automatically have these negative thoughts, and then we feel bad and wonder why! So the goal is to become more aware of our thoughts and then to change negative self talk to positive self talk. The most important step is to be aware of ourselves when we start having negative feelings. Some people are not aware of themselves and thus, keep feeding themselves with negative thoughts that do not help them in any way! “Those who believe and perform good deeds, We shall indeed grant pardon to them for their misdeeds and shall reward them according to the best of their deeds.” (Al Ankabut, 29:7). So the way to feel happier is to keep feeding your mind with positive self talk until you feel better. Your self talk should be something that you believe and should not be mere words. The universal example of this is a cup that is half filled with water. Some see the cup as half full. Some see it as half empty. It’s your choice how you see the cup. And your choice makes all the difference in how you will feel! “You shall certainly be tried and tested in your possessions and in your personal selves; and you shall certainly hear much that will grieve you, from those who received the Book before you and from those who worship many gods. But if you persevere patiently, and guard against evil, then you will surely triumph” (Surah Ale Imran, 3:186). “Whatever you have will end, but what Allah has is everlasting. And We will surely give those who were patient their reward according to the best of what they used to do” (An Nahl 16:96). An extremely important point to understand is that you are not your thoughts or feelings! A lot of people become confused with their thoughts and feelings as if they are one and the same! This is not true at all. You can learn to separate or detach yourself from your thoughts and feelings. You can look at your thoughts and feelings with an objective view and decide whether you really want to have those thoughts and feelings or not. This takes practice of course. #4 Does Islam Teach Us To Ignore Our Feelings? Being aware of your thoughts requires self honesty–being honest with yourself about your thoughts. It also requires self compassion–being understanding and caring towards yourself–a normal human being who has negative thoughts sometimes! 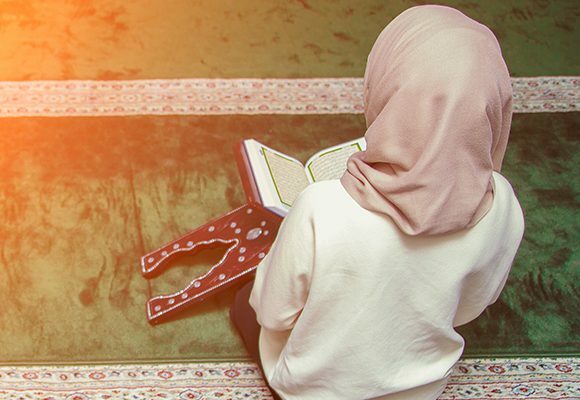 If we search the Quran and ahadith, we will find that Islam does not expect us to ignore our feelings and actually encourages us to face our negative feelings so that we can overcome them. As we can see from this blessed hadith, the Prophet did not rebuke people for admitting that religion can seem hard sometimes. The Prophet accepted this man’s feeling that sometimes religion can seem difficult, and then he gave the man some hopeful advice. Maryam (alayhisalam) expressed her pain and suffering in an honest way, and Merciful Allah does not chastise her for this, but He comforts her with a stream and fresh dates. The Prophet experienced negative emotions at times, and Allah offered him comfort and guidance. “Then perhaps you would kill yourself through grief over them, [O Muhammad], if they do not believe in this message, [and] out of sorrow” (Al Kahf 18:6). Our beloved Prophet experienced feelings of grief and sorrow, and Allah acknowledged his negative feelings and did not scold him for having such feelings. “…Call on Me, I will respond to you” (Ghafir, 40:60). An important point is that everyone has recurring thoughts sometimes that they can’t seem to get out of their heads. The main reason we have recurring thoughts is that something has happened that has seriously violated a core belief we’ve had all through life. Because beliefs are part of our identity, we can become quite shaken up when a belief has been seriously contradicted by a life event. It’s important to realize that it’s okay to realize that a lifelong belief you have held on to is not 100% accurate. These recurring thoughts are telling you to modify that belief in some way so that you can have an easier life. So again, you must start to be aware of your thoughts and beliefs so that you can modify them and thus feel better insha’Allah! For example, I once was quite internally shaken up by someone I realized was trying to use me for her own benefit while totally disregarding my wants and needs as a fellow human being. I was quite shaken up by this because I always saw people as inherently good. Even though I still believe that deep down people are good, unfortunately some people are so mentally disturbed that we cannot sit and wait around for them to become the good people they really are! Sometimes it’s best to set boundaries with those kinds of people, for our own mental health! But of course, the first step is to be aware of yourself and to accept your feelings as being there. Accepting your feelings means that you respect yourself enough to acknowledge that you have feelings. You don’t have to act out of those feelings, but you do need to accept them as being there in your heart. We can’t change something we don’t recognize or accept.